This Irish Santa is a policeman with a sack of shamrocks. Sorry, this figurine has sold out and we do not know if or when it may return. 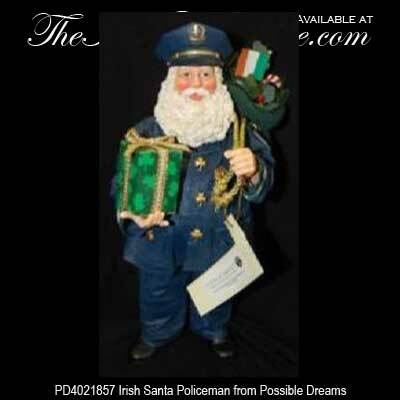 The Irish Santa police officer is a 10 1/2" tall figurine that features shamrock ribbon and buttons along with a sack on his back that is filled with shamrocks and an Irish flag. The Irish Santa policeman will make a splendid centerpiece at Christmas or may be displayed all year long. The Possible Dreams Irish Santa is made of porcelain and clothique and he is gift boxed with a shamrock history card that is complements of The Irish Gift House.